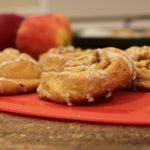 Simple Apple Pie Cinnamon Rolls are out of this world delectable. Warm out of the oven is the best way to enjoy these gems. Enjoy every cinnamon apple bite! If you have been on this blog before, you probably saw one of our most popular recipes ever. 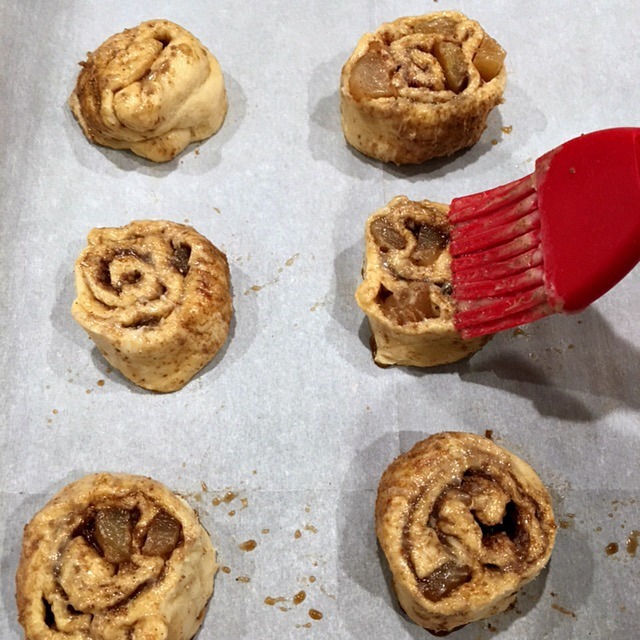 “Copycat Cinnamon Rolls”. They are out of this world delicious. Tastes just like the ones you get at the mall. Cinabon. We think so much better with much less fat and calories that’s for sure. Now, I have a new cinnamon roll to share with you. This time they are stuffed with diced apples. 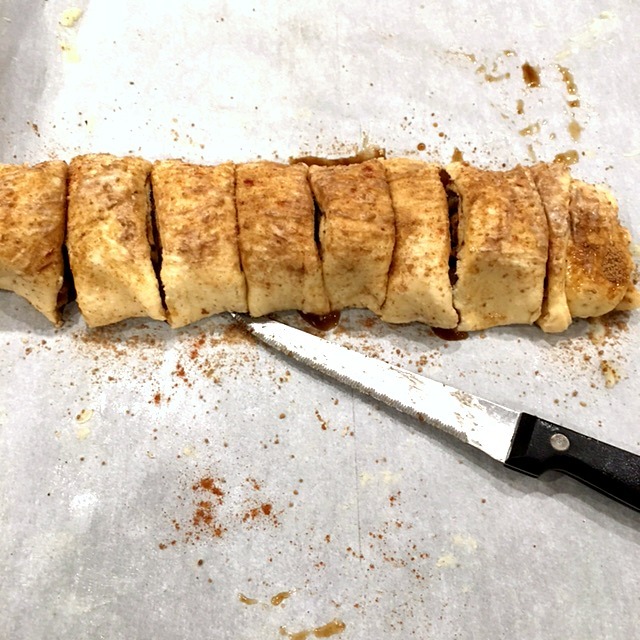 Just like a piece of apple pie in a nice flaky cinnamon roll. Try this simple recipe out. Everyone will love them. Great for any brunch or when the kids get off the bus. In a small bowl combine the brown and granulated sugar with cinnamon. Set aside. Melt the butter in microwave safe bowl and set aside. Now, take the tube out of fridge and roll out on a cutting board. Flatten the dough out with your hands to make a rectangle. No need to use a rolling pin but, you can. Just be careful not to make too thin. Drain apple cubes from container. Save that juice, it’s so naturally sweet and delicious. Toss the apples on top of cinnamon/sugar mixture. Gently press down with fingers. Place the slices on the baking sheet, cut side down. Brush remaining butter and cinnamon/sugar mixture over cut side down. While the rolls are cooling, in a small bow,l blend powdered sugar with liquid, mix up until you have a glaze consistency. If you have a mini whisk this makes for easier mixing. You can use a spoon or small fork as well. When the rolls are slightly cooled, drizzle the glaze over each roll. Let set up for just a few minutes. While still warm, take a big bite! 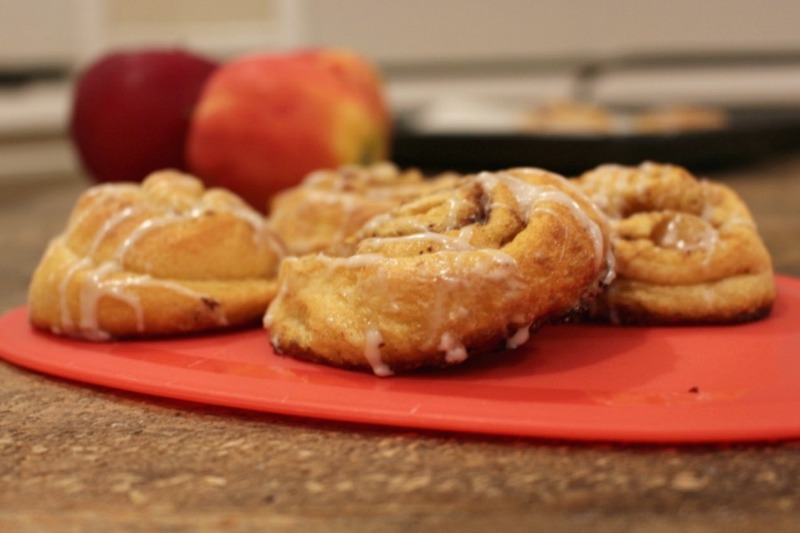 Enjoy the apple cinnamon deliciousness! 1.Preheat oven to 375 degrees; have a cookie sheet lined with parchment paper. Set aside. 2.Keep the tube of crescent rolls in fridge until ready to use and you have all your ingredients ready to go. 3.In a small bowl combine the brown and granulated sugar with cinnamon. Set aside. 4.Melt the butter in microwave safe bowl and set aside. 5.Now, take the tube out of fridge and roll out on a cutting board. Flatten the dough out with your hands to make a rectangle. No need to use a rolling pin but, you can. Just be careful not to make too thin. 6.Spread the butter with a pastry brush over the entire dough. 7.Sprinkle the sugar/cinnamon mixture over the butter (a nice coating). Save a little for when it’s rolled up. 8.Drain apple cubes from container. Save that juice, it’s so naturally sweet and delicious. Toss the apples on top of cinnamon/sugar mixture. Gently press down with fingers. 9.Starting with the shorter end, roll the dough up into a log. 10.Brush the remaining butter over the outside of the log and sprinkle the remaining sugar mixture over the butter. 11.With a sharp knife cut the roll into 8 slices. To do this, start by cutting the roll in half then half again until you have 8 slices. 12.Place the slices on the baking sheet, cut side down. Brush remaining butter and cinnamon/sugar mixture over cut sides. 13.Bake for about 10-12 minutes. Turn the pan around after 5 minutes and check after 10 minutes. They should look puffed, light brown and the bottoms will look light to medium brown as well. Remove from the oven and place on a cooling rack. 14. While the rolls are cooling, in a small bow,l blend powdered sugar with liquid, mix up until you have a glaze consistency. If you have a mini whisk this makes for easier mixing. You can use a spoon or small fork as well. When the rolls are slightly cooled, drizzle the glaze over each roll. Let set up for just a few minutes. While still warm, take a bite and ENJOY!